I was so excited on April 2nd. I couldn’t help getting up early that morning because the First Annual Cupid Splash was held on that day by Save the Harbor/Save the Bay! I was in a hurry to go to Revere Beach with my friends because I heard that Bruce Berman, who has worked with Save the Harbor for 20 years but who is also my professor at Boston University, was going to jump into the water with more than a hundred other participants to raise funds for the organization and the beaches. Thanks to the wonderful sunshine, I loved the big smile on everyone’s face on the beach. I felt that everybody was passionate and enthusiastic! There were adorable little children dressed up with big wings just like cupid, and many people wearing beautiful costumes. In particular, Ernie Garneau, who had a red face and a big red heart on his chest was really funny and outstanding! Seeing so many people jumping into the cold sea on such a winter day was impressive and unforgettable. They were brave! Hundreds of people witnessed and enjoyed the big event on all the other beaches as well. 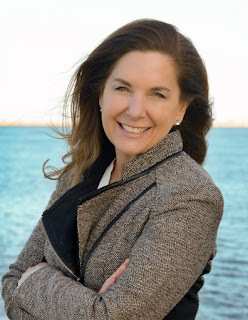 Promoting the ideas of protecting the beaches-- and raising funds for Save the Harbor and the beaches at the same time through this kind of activity-- was such a great win-win idea. I think it makes people realize the importance of beaches and the Harbor while having fun with them at the same time. I’ve already been looking forward to the Cupid Splash for the next year and I’ll be a participant if I have the chance! What’s more, I would like to do even more now to protect the beautiful beaches with Save the Harbor/Save the Bay. I thought you all might like to see this. Environmental Educator Bruce Berman of Boston University and Save the Harbor / Save the Bay was chosen "Most Valuable Teacher" by JetBlue Airways and will throw out the first pitch at game two of the Boston Red Sox / New York Yankees homestand in Fenway Park on Saturday, April 9, 2011. Berman teaches an undergraduate course in marine science as well as American management, business communication, and Boston Harbor history and policy in the Department of Administrative Science at Boston University's Metropolitan College where he has introduced hundreds of students from around the world to Boston's extraordinary harbor. 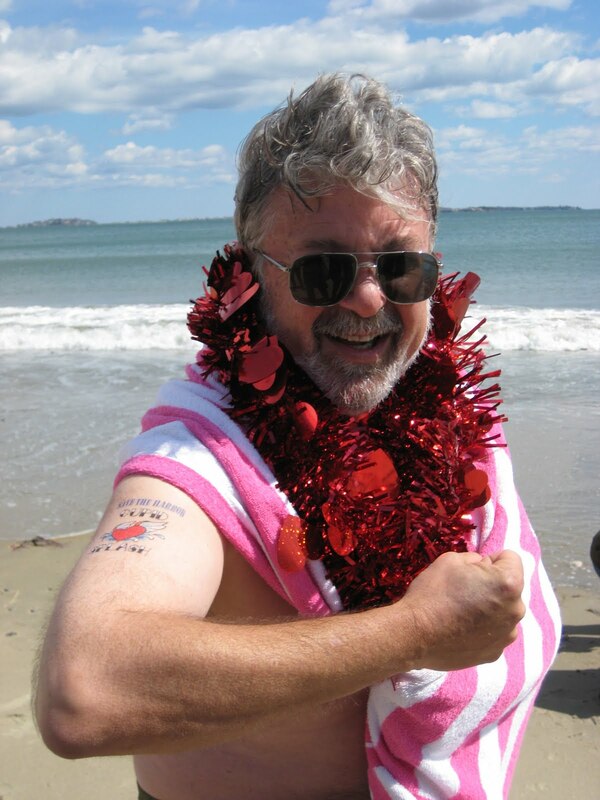 Bruce is also the lead architect of Save the Harbor / Save the Bay's free youth environmental education programs that have connected 50,000 youth and teens to Boston Harbor and the Boston Harbor Islands since 2002. 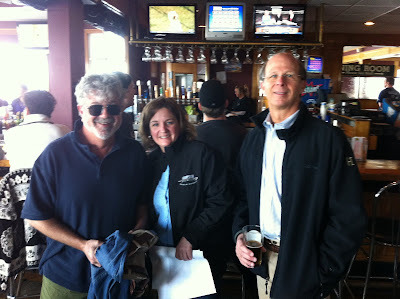 He and his wife Save the Harbor / Save the Bay's President Patricia Foley are avid Red Sox fans and live for most of the year on their boat "Verandah" at Constitution Marina on Boston Harbor. "Actually, it is quite and honor - and a big responsibility" said Berman, 55, who watches nearly every Red Sox game but acknowledges that he hasn't played much baseball since 1971. "I have much more experience casting for big striped bass on Boston Harbor than I do pitching at Fenway Park. But I have been practicing since I got the news last week, and promise to try to my best for my team." "Maybe they will play "Love That Cleaner Water" quipped Berman who has been the spokesman for Save the Harbor / Save the Bay for 20 years. I woke up early Saturday morning to find my father with red face paint on his face and a red heart on his chest. Yep, this is how I started the day off... only be followed by more craziness. Revere Beach hosted Save the Harbor / Save the Bay's first annual Cupid Splash on Saturday, April 2nd. The sun was shinning, the birds were out, the wind was blowing, and the water… was cold. Despite the temperature it did not stop the brave volunteers, who ran with open arms into the water. 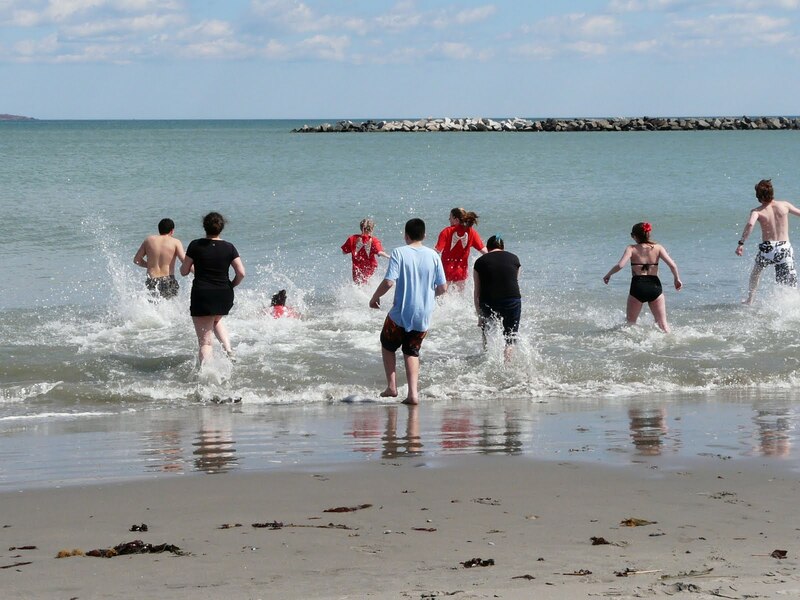 I have never seen so many people happy to run into freezing cold water! Despite my father’s attempts at black mailing me; I refused to go in. The event itself was wonderful even as a spectator; there was music, plenty of people-- many dressed in their best cupid themed attire-- hot clam chowder from Summer Shack, and Kelly’s Roast Beef. There was a even film crew from the local news channel and plenty of cameras going off. The reason that this splash was so special was because it is the only splash that is for the beaches, the beach communities, and the environment. Everyone raised money to aid in keeping our local beaches clean and providing free events and activities-- and that was definitely the reason that everyone came out of the water with a big smile on their faces. I cannot wait for next year’s splash to see it get bigger and even crazier! This April 2nd was a gorgeous day, not just because of the amazing weather-- with the lovely sunshine and the pure blue sky-- but it was also our First Splash of Spring at Save the Harbor/Save the Bay. 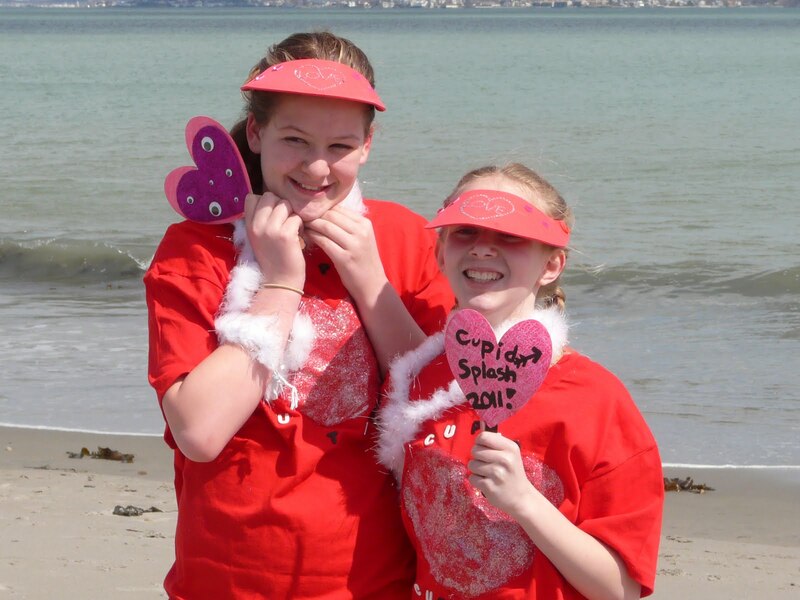 Me and two other interns were assigned to help the Cupid Splash event at Revere Beach, which is the biggest fundraiser out of all the eight beaches that day. 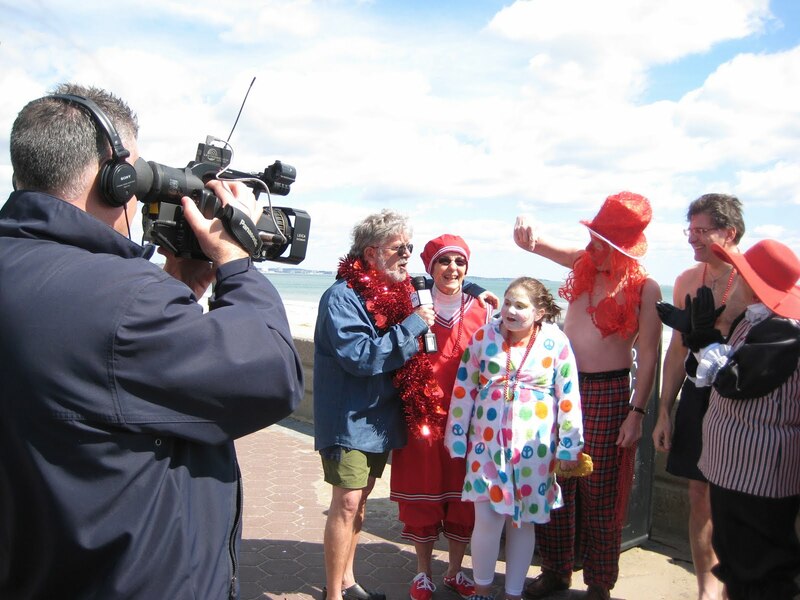 There were so many people on the Revere Beach for the event including community members, reporters, Save the Harbor staff, and all our proud and brave splashers who made this extraordinary event possible. We set up our table and tent next to the beach and gathered all the splashers to take group pictures. 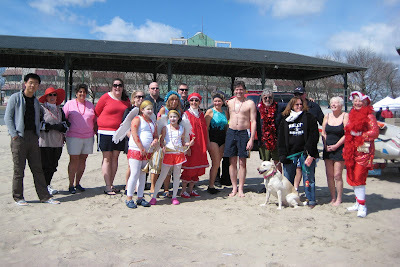 Although the weather was great, it was still windy on the beach, which made running into the water with cupid costumes on still a little bit cold. However, all our brave splashers ran into the water, and the event was exciting! Free tasty hot clam chowder and hot chocolate were served to warm all the splashers up. After the event we drove to 338 Grill pub for the warm-up party and enjoyed the free Harpoon beer provided by our sponsor, Harpoon Brewery. We celebrated the great success of our event and had lots of fun together. Everybody enjoyed the day so much on the beach. As an intern at Save the Harbor/Save the Bay, I'm so happy that our 1st Cupid Splash ended up with huge success and happiness. Thanks to all our participants, sponsors and donors, we have proudly raised more than $20,000 for our local pubic beaches and our communities. We will keep doing this and I believe it's going to be even more fun in the future with more new ideas and even more splashers!